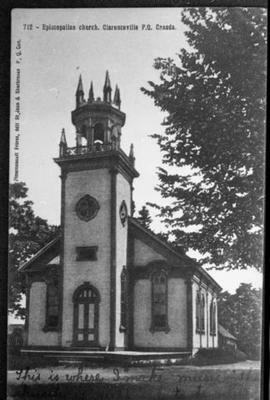 Item is a photograph of the Episcopal church located in Clarenceville. Item is a photograph of the home and family of Truman B. Derick in Noyan around 1890. The item is a postcard of the Clarenceville Academy, also known as the Model School, from around 1905. The sub-series contains primary source documents primarily on the property of William J. Derick in Noyan in 1815 to 1907. It consists of land transactions, an account book, family genealogical details, and a record of seigneurial rents. The sub-series contains information on the life John P. Derick in Noyan from 1816 to 1853. It consists of land transactions, a customs house certificate, wills, an inventory, and receipts. The sub-series contains information on the property of Elizabeth Derick in Noyan in 1852. It consists of a copy of a land transaction between Elizabeth Derick and her nephew, David Derick. The sub-series contains primary source information on the life Charles Derick in Noyan from1841 to 1910. It consists of a journal with remarks on Charles' activities and family, land transactions, a marriage certificate, and correspondence. The sub-series contains primary source information about the property of Philip Derick in Caldwell's Manor from 1784 to 1810. It consists of land transactions, receipts, and a loyalist compensation receipt. Item is a photograph of A.H. Derick's General Store in Clarenceville around 1890. The item is a photograph postcard showing the train station,station jointly operated by the Grand Trunk Railway and the Quebec Montreal and Southern Railway, at Noyan Junction from about 1910. The item is a photograph postcard of the steamboat "Ojibway" on the Richelieu River in 1908. 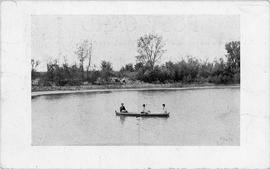 The item is a photograph postcard with a view of the Wilson residence along the Richelieu River from 1907. The item is photograph postcard of a house and dock along the Richelieu River from 1907. The item is a photograph postcard of town of Noyan, looking west, from 1907.